*What Are The odds you Can Use At Least One? Look For This Book In The Kindles Owners’ Lending Library! *Improve Your Project and Process Management Skills! Strategic decision makers must think in principle about ends and means as they frame a solution to a problem, but execution deals with particulars. In the realm of the tactical manager there is no someone, there is only you or me. There is no somehow, there is only ‘how’. Tactical management is the planning, organization, direction and supervision of available means to a chosen end. 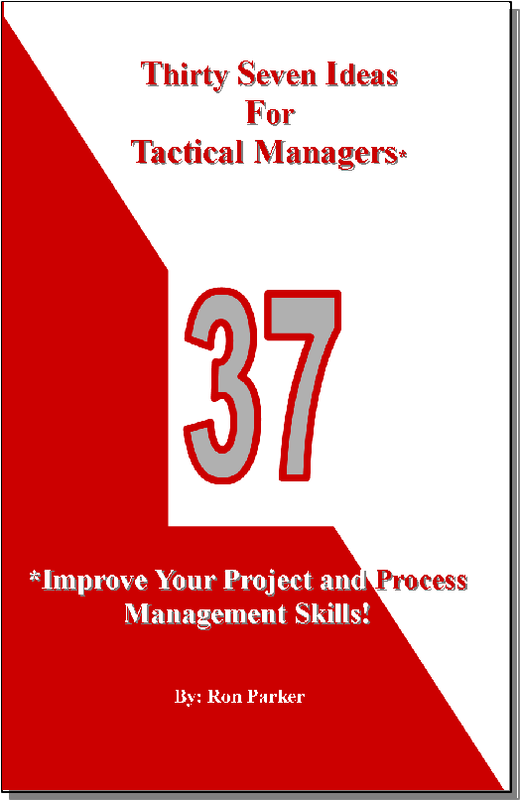 Project and Process Management are the crucial tactical management skill sets. Like a left hand and a right hand, they are complementary and most effective when their relationship is understood and exploited. The purpose of this book is to establish a solid-ground framework for process and project management. Through small and easy steps, you will increase your knowledge of tactical management and your confidence in evaluating the latest techniques and fads of this discipline. How do experienced project managers cope with change? How can you manage without criticizing? What basic issues does a theoretical approach to process and project management sometimes overlook? What is capability, capacity, sigma, earned value, utilization, measurement precision, linearity, stability, uncertainty? What is the difference between strategic and tactical management? Why do Information Technology tools for project and process management sometimes fall short and create confusion through unintended consequences? If you have been blitzed with management training that has left you with more questions than answers, then take a look at this book. Beginners and experienced tactical managers will want to keep this book handy for quick reference. You can buy it at AMAZON today! Click the link on the left. Tactical management is the planning, organization, direction and supervision of available means to a chosen end. Project Management and Process Management are more than certifications or job titles. They are tactical management Skill Sets. Like a left hand and a right hand, they are complementary and most effective when their relationship is understood and exploited. The end result of a project is a deliverable, usually a facility, tools or intentional methods that will be integral to new processes. Projects have a beginning middle and end. When the deliverable has been achieved, the project is over. The end result of a process is readiness, an ability or capability of consistent product creation – provided that it is fed appropriate raw materials. Those raw materials could be orders, specifications and physical materials in a manufacturing environment, or customer requests in a service environment. Unlike projects, processes do not end. If unmanaged, they can fall into dis-repair. They can fail to sustain their readiness to deliver the chosen output. They can drift off target or produce undesirable results when fed improper raw materials. They can be dismantled, mothballed and shut down….